Lambourn, Berkshire, UK. It’s a cloudy yet hot, muggy summer’s day, the mercury creeping into the high 20s by early afternoon. The countryside, booming with life after a soggy winter, is awash with vibrant greens and glorious yellows, vegetation clambering high for the sun above. GT3 RS. The ‘Lizard’, as it has affectionately become known as by enthusiasts, storms along an undulating B-road, its low-slung nose glued to the asphalt at the front, its striking wing towering into the sky from behind. Following closely behind is another visually arresting 991: a Miami blue GT2 RS, no less, offering a hot pursuit as it too bobs along, its chassis stubbornly hugging the contours of this bumpy British back route. Currently the hottest two products from Porsche’s famous GT line, seeing – and hearing – these two 911 Rennsports as they tear through the countryside is one of the most visually arresting sights anyone will have seen for a long time. Boasting gargantuan presence on the asphalt, their rarity (not to mention value) means it won’t be often you’ll see even one of these blue-chip 911s on the public road, let alone both at the same time, side by side. These are two 991s married by their devotion to delivering the ultimate in modern Porsche performance in focused, lightweight packages, divorced spectacularly in exactly how that performance is administered. 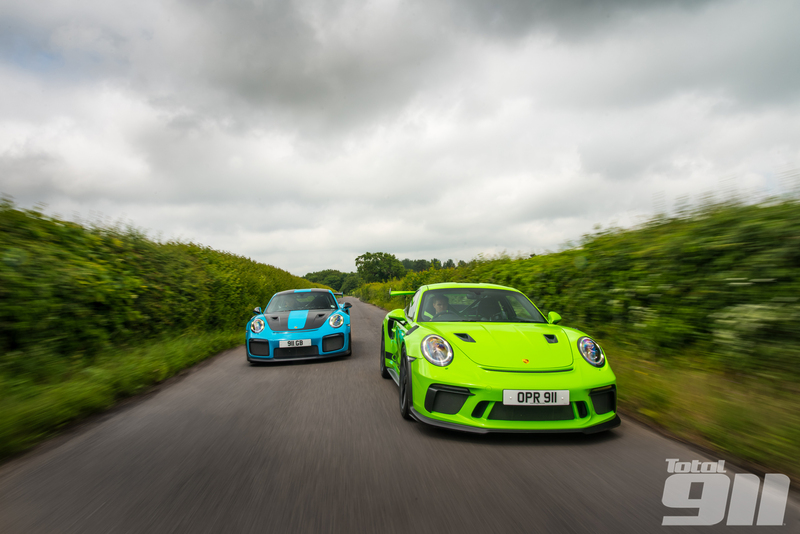 It’s 991 GT2 RS v 991.2 GT3 RS – and we’re the first to put these two titans to the test. Delve a little deeper and you’ll notice the two cars have many similarities in their spec: the most obvious is simply outrageous aero on a super-wide Turbo body. Then there’s a PDK gearbox, an electronic differential and rear-axle steering, not to mention a comprehensive weight-saving program which includes thinner glass, a deployment of different materials and a removal of sound deadening. But there are key differences too, beginning, of course, with their respective flat sixes. The 4.0-litre unit in the back of the GT3 RS has been carried over from the 991.2 GT3, albeit with revised breathing (in the form of modified intakes and a titanium exhaust) for an extra 20hp, its 520hp total an astonishing feat for a naturally aspirated, six-pot motor. That maximum output is realised at a heady 8,250rpm, though its redline is the headline snatcher, it being a mighty 9,000rpm. This is the first Rennsport to spin all the way up to a full nine grand after the 991.1 was pegged back to ‘just’ 8,600rpm. The GT3 RS’s engine credentials are mighty, but its Miami blue brother takes things further still – to the tune of 700 maximum horsepower and a ludicrous 750Nm peak twist. The GT2 RS achieves this via alternative means to the atmospheric GT3, bolting bigger turbochargers to the 3.8-litre 9A1 engine found in the 991.2 Turbo S. A remap sees this blown Rennsport achieve what is unprecedented power and torque figures for any road-going 911, ever. But how do these polarities in power delivery translate on the road? Or do their similarities justifiably pull them together? Most importantly of all, which of these 991 Rennsports offers the most thrilling drive? We had better find out. For the full feature, get your copy of Total 911 issue 168 in shops now or get it delivered to your door. You can also download hi-res digital copies for any Apple or Android device.